Japanese knotweed is a pioneer species that is believed to have its origins in the volcanic mountains of Japan some 150 million years ago. Its ability to survive in hostile conditions at high altitude, helped it to gradually spread across what is recognised as its native territory of Japan, Korea, Taiwan and parts of China. Across Japan it is known as Itadori, and is foraged for food and used in traditional medicines. Japanese knotweed is known to contain resveratrol, a chemical also found in red grapes, which is thought to act like antioxidants do, protecting the body against damage that can put you at higher risk for things like cancer and heart disease. During the Victorian era, European pioneers travelled the world collecting exotic plant and animal specimens to bring home and sell – In effect founding the horticultural market as we now know it. 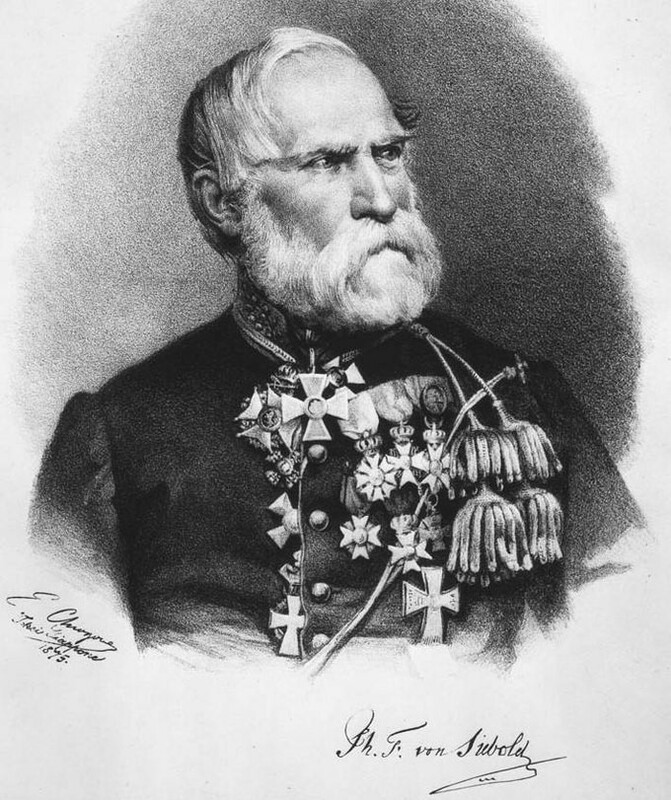 It was one such pioneer, a Bavarian physician and keen botanist Philipp Franz Von Siebold who came across Japanese knotweed. Siebold collected thousands of plants during his posting in Japan in the Dutch trading post on Deshima, including many of our garden favourites such as the peony-rose, hydrangea, camellia and wisteria. Von Siebold returned to Holland with his collection and founded a commercial nursery in 1840. From there, samples of his plants were distributed and sold across Europe. Japanese knotweed was sent to Kew Gardens in London in 1850, and with a gold medal awarded by the Agricultural and Horticultural Society in Utrecht to its name, it became a firm favourite amongst nurserymen and gardeners alike. There are also reports that an earlier sample was sent to the Royal Horticultural Society in London in 1825 – although it is not believed to have been widely distributed at that time. Japanese knotweed has now spread across the continents and is a problem in several countries including North America, Canada and New Zealand. By 1869 Japanese knotweed was widely available for sale to the public in the UK and was even used by farmers as animal feed. It was also noted for its industrial applications such as the stabilisation of railway embankments and spoil from mines. As we know, fashions come and fashions go, and by the time the fashion went there was no stopping the invasive species spreading throughout the UK. The rapid industrialisation and development of infrastructure across the country, coupled with the lack of bio-security allowed knotweed to spread exponentially. By 1900 it had been reported as naturalised across the UK, where it was found growing outside of gardens in many parts of the country. As early as the 1930s, it started to negatively affect the price of housing, and was known locally in Cornwall as “Hancock’s curse”. We now estimate that up to 1 in 20 residential properties are affected in some way by Japanese knotweed, with a presence in every 10 square km patch of the UK. From a biodiversity point of view, Japanese knotweed is an aggressive and invasive species that quickly outcompetes our native flora. Evolved to tolerate much harsher conditions, our temperate climate, fertile soils and a lack of natural predators mean knotweed has the advantage. For that reason, Japanese knotweed was listed on Schedule 9 of the Wildlife and Countryside Act 1981, making it an offence to plant or otherwise allow it to grow in the wild. The aggressive nature of the plants, and ability to survive in unfavourable conditions mean that they can cause damage to the built environment too. We often see cases of damage to hard surfaces such as patios, asphalt and drains. Although it is a myth that knotweed can grow through solid concrete, it certainly has no problem exploiting the smallest of gaps and weaknesses, eventually causing real damage. For further information on the type of damage knotweed can cause, check out our short video and picture gallery . Given the damage that knotweed can potentially cause to property, banks and building societies in the UK have imposed strict lending criteria where knotweed is identified. The Royal Institute of Chartered Surveyors published guidelines for their members on reporting and assessing the risk from infestations in 2012. As a result of this, the Law Society added a question about knotweed to the pre-enquiry form (TA6) used in the sale of property, meaning vendors now have an obligation to declare knotweed on their property. It is widely acknowledged that the presence of Japanese knotweed on a property can negatively impact its value and saleability. Thankfully, many lenders take a pragmatic approach and with the right treatment programme and guarantee in place, you should have no problem selling a property affected by knotweed. At Environet we have successfully helped hundreds of people through the sale process. Read more about selling an affected property here.